Home } Book Signings } Creepy Capreol Launches! 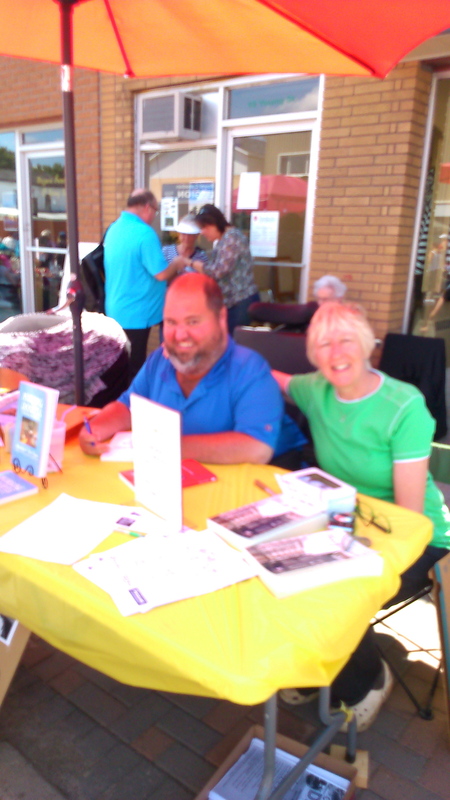 Saturday, August 2nd was a big day — the official launch for Creepy Capreol: Chilling Tales From a Railroad Town. 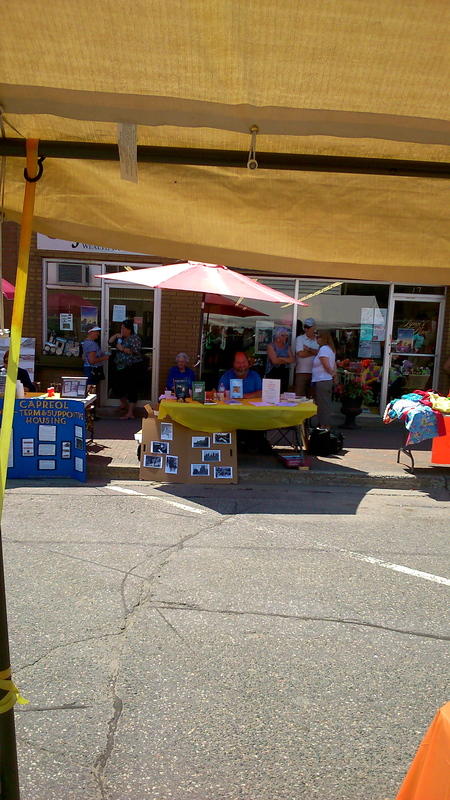 Young Street was hopping all day, with hundreds of people gathered for Capreol Days. Vendors of all sorts were parked between King and Front — selling everything from food to jewellery. Things were just getting started when I arrived downtown at 9:30. I had a prime spot in front of Lynn’s Place and, with a few quiet spells, was kept busy throughout the day. In fact I sold an amazing 73 copies of Creepy Capreol! Of the original 120 I’m now down to 9 (I sold some before the launch and gave a few away). So it’s time to order more. 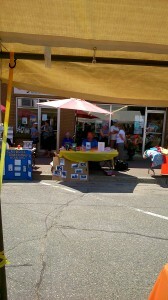 Capreol Days proved a big day for MadCap Publishing (my fledgling publishing company) in other ways too. CC sold extremely well, but even my older titles moved. Plus we received a full page spread in Saturday’s issue of the Sudbury Star — on Page 1 … of the Leisure Section. Bob Michelutti’s illustration looked great — I might cut it out and frame it! Better still three of Creepy Capreol’s contributors made it out — Sudbury Writers’ Guild members Betty Guenette (with husband + dogs) and Lisa Coleman-Brown (and husband), plus former Capreol resident Jason Shayer (with his wife and kids). All three have now received their free contributor’s copy, and two got the original artwork for their story. Fellow SWG member Renny Degrott-MacKinnon joined me to sell her book Family Business. She had a good day as well, selling nine copies and earning herself some fan mail. Up next … Valley East Days in early September (Renny will be joining me there too) and the Terror Train/Fright Night events come late September through October. And maybe, maybe, a signing at Chapters and/or the City of Sudbury’s main library. Fingers crossed! Mat Del Papa, August 6, 2014. 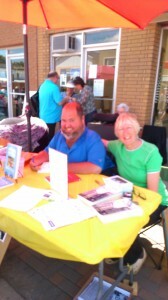 1 Comment on Creepy Capreol Launches!.Category: Book Signings, News. Tracy Pepper grew up in Hanmer. In 1985 she was diagnosed with a rare form of ovarian cancer and was not supposed to survive. Last year she climbed Mount Kilimanjaro to raise money for ovarian cancer. 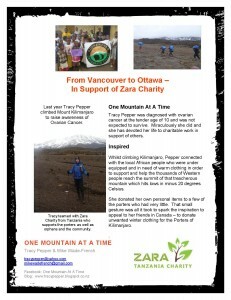 That accomplishment got her invited to contribute to a book project called Dreamers & Doers – inspirational stories of women who have climbed Kilimanjaro (see attached posters). 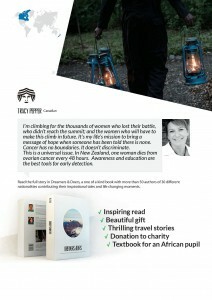 Tracy loved the project because it supports another charity, every book sold buys a textbook for a child in Tanzania. They believe every child has the right to an education. 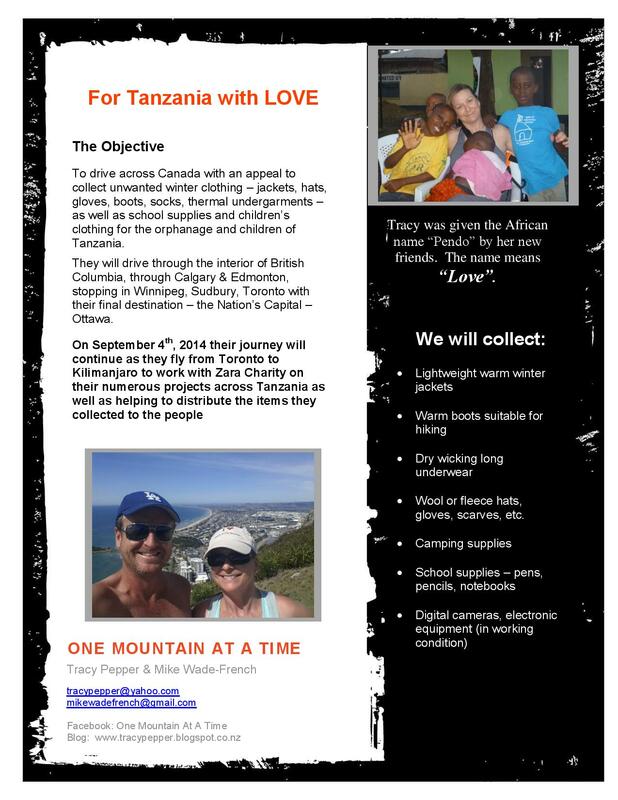 Tracy is now working with a charity in Tanzania and will be driving across Canada this summer collecting unwanted winter clothing for the porters of Kilimanjaro and school supplies for the Kilimanjaro Orphanage. She is also promoting this book and looking for businesses and book stores who would be interested in supporting this mission. Every book sold supports a charity that buys a textbook for a child in Tanzania. Here’s a link to the video that explains the project. Tracy will be at the Fromagerie on Elgin on Saturday, August 9 at 3:00pm to tell her story, sell some books, and collect donations. Mat Del Papa, July 29, 2014. No Comments on Tracy Pepper — Dreamers & Doers Book Launch — Aug. 9.Category: Book Signings, News.